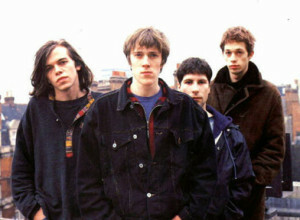 Ride were a British shoegazing band from Oxford, England. The band formed in 1988 and stayed active until 1996. Its members included Mark Gardener (vocals/guitar), Andy Bell (vocals/guitar), Steve Queralt (bass), and Laurence Colbert (drums). Ride, along with My Bloody Valentine and Slowdive were the main acts associated with the shoegazing scene in the U.K. in the late eighties and early nineties. The British press, particularly N.M.E. and Melody Maker named the musical style shoegazing; simply because the band stood still and stared at the stage the entire performance. The heavy use of effect pedals in this style of music also contributed to always staring at their shoes. The Oxford four piece began recording together when they were teenagers and released a self-titled EP in 1989 and another EP Play in 1990. Both recordings were well-received by the British press and the band began to form a loyal following due to their loud and intense shows. Later in 1990, Ride released their critically acclaimed full-length debut Nowhere, and then another EP Fall. The album Nowhere charted well and produced the single “Vapour Trail,” all while the band continued to grow a passionate fan base. Nowhere is an indie classic that showed up on almost all best of the nineties lists and also made it into the book 1001 Albums You Must Hear Before You Die. The band followed-up their success by releasing Going Blank Again in 1992. At this time Ride was starting to receive world wide praise and the singles “Leave Them All Behind” and “Twisterella” were in heavy rotation on alternative rock radio and MTV’s 120 Minutes. By 1994 the band decided that a change in musical direction was in order and it was time to lose the shoegazing style for more of a conventional psychedelic rock sound. The lack of commercial success along with the negative reception of the third LP Carnival Of Light led to tension within the band. This tension continued throughout the recording of the fourth album Tarantula and Ride disbanded in January 1996.